Properties in Leitrim average 4.5 out of 5 stars. Central location - Walking distance to town centre, shops and restaurants. Property 1: Central location - Walking distance to town centre, shops and restaurants. Property 5: Cosy cottage to relax, unwind and unplug. 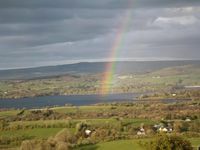 Property 6: Overlooking the Loch Melvin and the Leitrim Hills in quiet rural location. Stone Cottage in Peaceful country Setting. Property 7: Stone Cottage in Peaceful country Setting. Luxurious Holiday House for any occasion . Come and see for yourself. Property 21: Luxurious Holiday House for any occasion . Come and see for yourself. The large 4 bedroom bungalow is located in the small village of Kinlough. 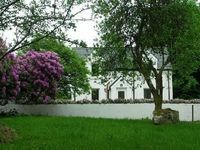 Property 40: The large 4 bedroom bungalow is located in the small village of Kinlough. We loved staying at the house near Sligo Town. So many beds, a huge kitchen, and lots of amenities included. Netflix is on the TV. You'll need a car. It's about 15 minutes drive from a supermarket. Easy access to many local towns and beaches. The views and hiking around there are excellent. You'll love it too. My family and I had the pleasure of staying in this beautiful home nestled around magnificent trees and beautiful Irish countryside this Christmas. Mary is a very gracious host and our every need was met, The house itself is charming, with a lovely fire space both in the living room and dining area.It was spacious for a family of 5, very clean, with all the facilities you would need but also really comfortable and relaxing. We found ourselves cuddled up in the sitting room at night feeling so grateful that we had such a lovely home to stay in while we were in Ireland. The location was ideal for us being only 20 minutes to Sligo, 5 minutes to Manorhamilton, and 40 minutes to Bundoran. We were able to visit Rosses Point beach, Parks Castle, W. B. Yeats grave, and many other numerous outdoor attractions within those times. All my family agree we would love to stay here again and especially would love to enjoy the home in the Summer.